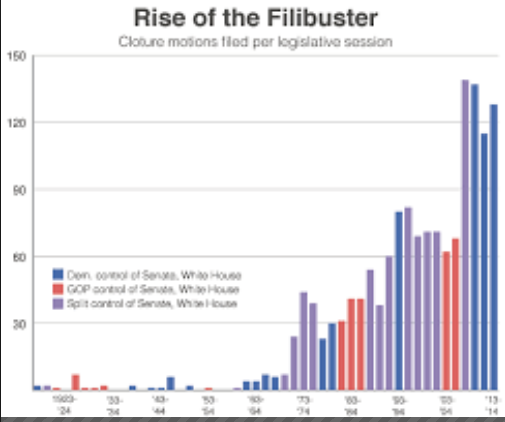 Both sides have chipped away at this right to filibuster in recent years. Democrats restricted it for circuit-court judges in 2013 (a move that, I wrote at the time, they would come to “deeply regret”), and McConnell’s Republicans restricted it for Supreme Court justices in 2017. But McConnell has now significantly escalated, reducing the right to delay consideration of judicial or low-level executive nominees to two hours from the current 30. It’s clearly just a matter of time — a few years, perhaps — until this leads to the complete abolition of the filibuster for everything, including legislation. This will further destabilize a federal government that has suffered many such blows during the past two years. And McConnell took this extraordinary step — the “nuclear option,” as it is known — on the mundane matter of confirming an assistant secretary of commerce who had no opposition. He did it even though the Senate has confirmed more appellate-level judges for Trump than for any president during his first two years in office going back to at least Harry S. Truman. McConnell’s move, it appears, had more to do with the mindless one-upmanship of our tribal partisanship. Sen. Tom Cotton (R-Ark.) blurted out this motive on the Senate floor, saying his vote was “revenge” for a move by Schumer to block a nominee — 16 years ago. “Today, Sen. Schumer will reap what he sowed,” Cotton declared.